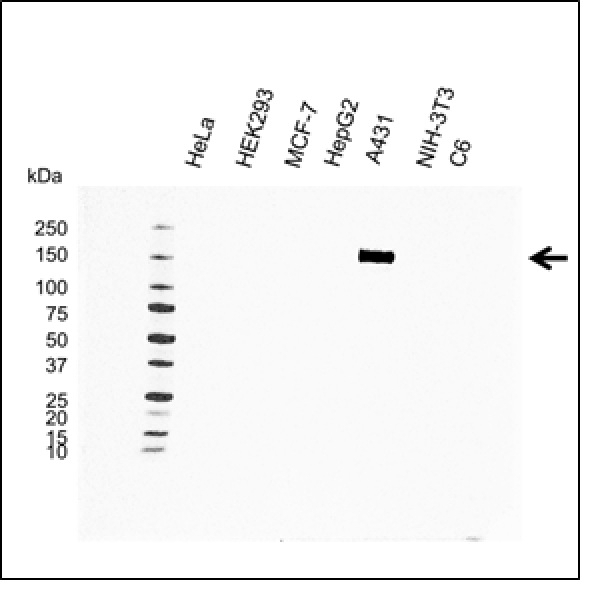 Western Blot analysis of EGF R expression in various cell lines using Mouse anti Human EGF Receptor (MCA5986GA). Mouse anti Human EGF Receptor, clone G02-2D5 recognizes the epidermal growth factor (EGF) receptor, a 150 kDa transmembrane receptor also known as ERBB1. The EGF receptor is a member of the ERBB family of four structurally related receptor tyrosine kinases. Binding of one of the many EGF receptor ligands (EGF, amphiregulin, TGFα, epiregulin) causes homodimerization of the receptor. This leads to downstream activation of several signalling pathways including MAPK/ERK, PI3K/Akt and PLCγ/PKC (Prenzel et al. 2001). Overexpression of the EGF receptor promotes gene amplification and mutation consequence in cell proliferation, survival, invasion, metastasis, and tumor induced neoangiogenesis (Ciardiello & Tortora, 2008). Ciardiello, F. & Tortora, G. (2008) EGFR antagonists in cancer treatment. N Engl J Med. 358 (11): 1160-74. Prenzel, N. et al. (2001) The epidermal growth factor receptor family as a central element for cellular signal transduction and diversification. Endocr Relat Cancer. 8 (1): 11-31.